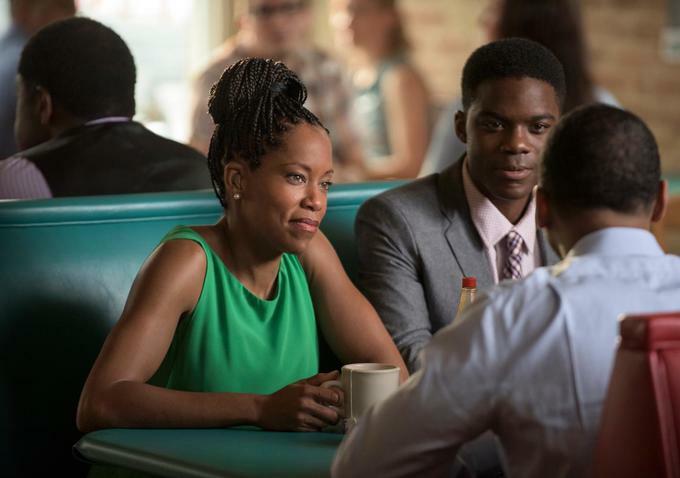 There was an odd contentment that filled the air of the first season of The Leftovers. And the strangeness that sucked viewers in back then has been turned up a notch for season 2. When the premiere episode begins, the familiar characters from last season are nowhere to be found. Instead, we follow early humans through the desolation of beginnings of humankind. Within minutes, an earthquake and rockslide kills an entire group of humans, leaving a single pregnant woman to fend for herself. The scene only gets more bleak from there as she delivers the baby alone and struggles to keep herself and her baby alive. In the end, she dies grasping for breaths as her baby cries. That depressing intro launches directly into present day, as teenagers frolic in the body of water next to where the woman took her last breaths. That eerie balance of sadness and joy is what comes to define the balance of the episode. The show has now moved locations to Jarden, TX, a town that has also come to be known as Miracle because it is the only place in the world where there are no reported departures. The most unexpected aspect of the premiere was that none of the season 1 cast members made appearance until about 2/3 of the episode had aired. Instead, we follow the lives of the Murphy family. The father John, played by Kevin Carroll, is the town’s fire chief and de facto guardian, has a weird penchant for eating bacon and eggs only if served on separate plates, is a chronically heavy sleeper, and is obsessed with locating a cricket in their home. The mother Erika, played by recent Emmy winner Regina King, is a nurse who is notably deaf, steadfastly supports her husband’s decisions, and is adamantly protective of her family unit. Their twin children Yvette and Michael, played by Jasmin Savoy Brown and Jovan Adepo respectively, are a hard partying daughter with epilepsy and a church zealot son with who doesn’t seem to have a problem subtly criticizing his father’s questionable actions. As intriguing as all that is, things start to take a turn for this town intent on maintaining its own sense of normalcy when a local psychic (Darius McCray from “Family Matters“) gives John a negative prophecy. The Garveys also arrive and move in next door, and as season 1 more than proved, that family seems plagued with pain, loss, and misfortune. This show is too WTF to spoil completely (you’ve got to see it to believe it), but just when you think things can’t get weirder, they do. And perhaps the most disturbing aspect of it all is that, with each jaw-dropping and confusion inducing development, the characters on screen accept everything as normal. From the random tremors to the ragged man in a lookout tower in the center of town to anomalous animal butchery, there seems to be a warped logic to it all that we are left out of. No, none of this seems to make any sense. And the longer you watch, the more confused you’ll be. But that is what made season 1 a season not to be missed. In a television climate where shows are expected to string viewers along with a sequence of questions and answers, The Leftovers takes a detour to a place where nothing is out of bounds and there is no limit to the depths humans will go. And that eerie overhang of unexpectedness looms unashamedly at all times. I can’t quite call it refreshing, but I’m certain it is brilliant.